← Flowery Thoughts – People and Museums Working Together! The American West is seen in the eyes of many as a place of freedom, expression of youth, and the location of some of the most beautiful natural spaces the country has left to offer. The infamous landscapes of Yellowstone and Yosemite national parks have attempted to preserve portions of the West’s natural beauty for posterity, along with the wildlife that once roamed there. Millions of visitors travel to these places every year in an attempt to experience the West as it once was. However mythical this view might be in relation to reality, it belongs to a visual history dating back to America’s formation, which many artists have endorsed through drawing, painting, photography, and print, including Arthur Fitzwilliam Tait (1819–1905). Tait was born in 1819 outside of Manchester, England, and immigrated to New York in 1850 following his marriage to Mary Ann Cardwell.¹ During this time there was major cultural upheaval in the United States. Outside of growing internal tensions over slavery, the U.S. government was struggling to expand westward against the sovereign indigenous tribes that still inhabited the region. 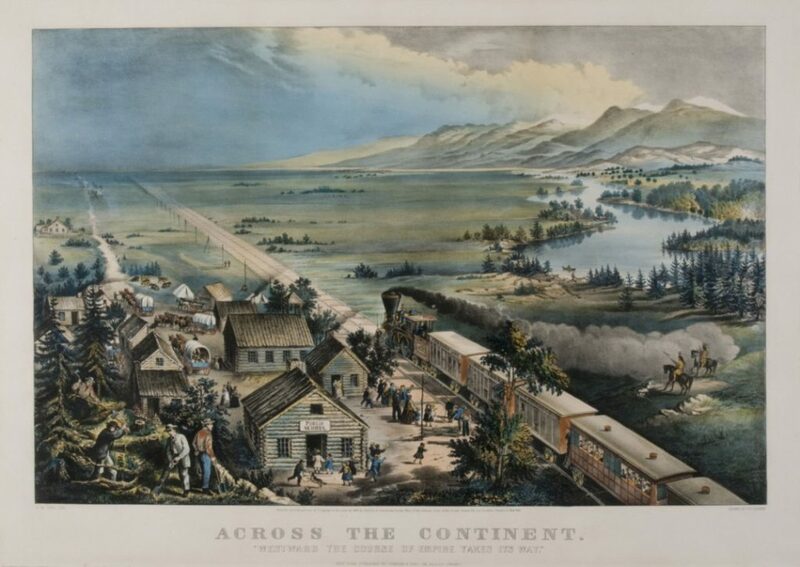 Popular support for this expansion was garnered through the idea of Manifest Destiny, conceived of in 1845 by John L. O’Sullivan and visualized in the Currier & Ives’s print Across the Continent. Westward the Course of Empire Takes Its Way. Tait began working with the printing firm Currier & Ives in 1852 and soon became one of its most renowned artists. He was best known for his idyllic sporting and animal prints along with his paintings of the outdoors; ² however, his representations of the West in particular serve as a helpful view into Eastern conceptions of the frontier during the nineteenth century, when many American citizens held the progressive hopes of their nation. Yet if we look more deeply at Tait’s images and their place within imagery of the West, we can see their romantic vision as a frontier myth built on promoting expansion. Catlin’s words come to life in Tait’s romanticized Life on the Prairie. The Buffalo Hunt, where white men in buckskins can be seen on horseback chasing bison through rolling fields of grass. Arthur Fitzwilliam Tait, Life on the Prairie- The Buffalo Hunt, 1862, Hand-colored lithograph. Winterthur Museum, Garden & Library, Gift of Charles K. Davis 1953.0155.074. The artist’s embrace of such frontier descriptions is reflected in a self-portrait taken circa 1850. 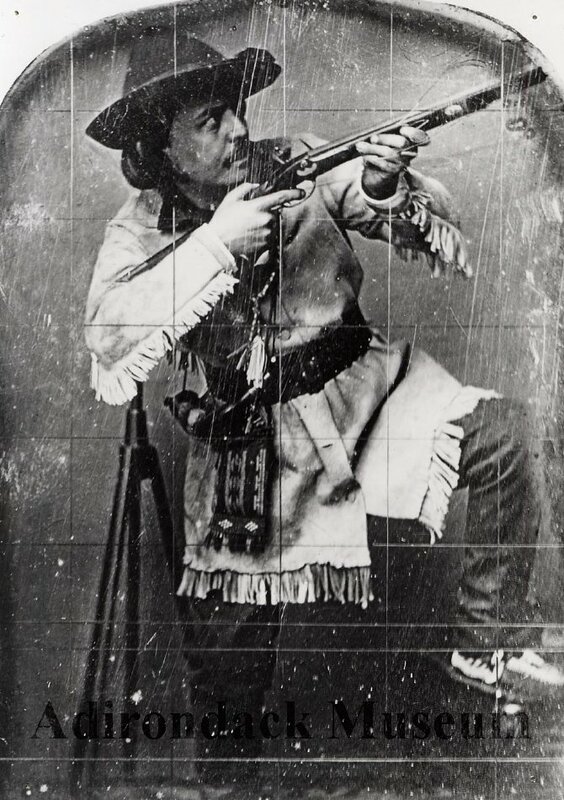 Tait dressed himself in garb reminiscent of Davy Crockett, a man widely known in the period as the “King of the Frontier.” Tait’s multicultural outfit (Americanized buckskin shirt, plains-beaded pouch and moccasins, felt hat, and rifle) illustrate the artist’s romanticized view of the Western frontier as a playground where men played dress up and colonial power had already been asserted. Arthur Fitzwilliam Tait, Self-Portrait, ca.1850, Photographic print, Adirondack Museum, 1985.059.0002. Yet the idea of the frontier that appears in Tait’s self-portrait came at the decimation of everything that was already there. The artist’s 1862 Life on the Prairie becomes eerily foreshadowing when one is reminded that by the time of the Plains Indian Wars in the 1880s nearly all of the free-roaming bison in the United States had been killed. Their numbers went from an estimated 30 million in the mid-1800s to less than 400 by 1893. 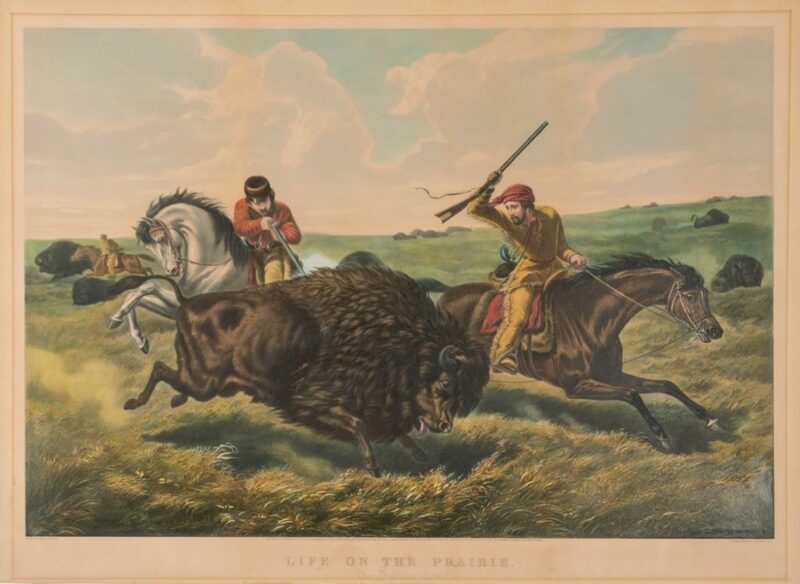 At the time of Tait’s print’s production, the frenzy for bison and their hides had reached such a high that white hunters were severely depleting the once-massive herds, in turn undermining the tribes whose lives depended on them for physical and spiritual sustenance. This connection between Native Americans and bison became a visual trope as the century came to a close. Famous landscape painter Albert Bierstadt took up the subject in his well-known painting The Last Buffalo from 1888. In it he composes a prairie scene in which herds of buffalo are being hunted by Native American men on horseback. By this time, both groups were considered on the brink of extinction by the white civilization that helped to destroy them. Bierstadt’s painting, along with Tait’s print, are then best understood as artistic compositions combining memory, myth, and the progressive hopes of a nation. 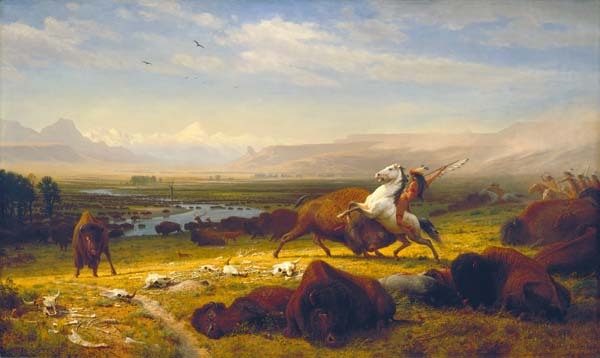 Albert Bierstadt, The Last Buffalo, 1888, oil on canvas, Corcoran Gallery of Art, Gift of Mary Stewart Bierstadt, 09.12. Don’t miss the upcoming exhibition Lasting Impressions: The Artists of Currier & Ives in the Galleries September 17, 2016–January 8, 2017 at Winterthur Museum. ¹ Warder H. Cadbury, Arthur Fitzwilliam Tait: Artist in the Adirondacks (Newark: University of Delaware Press, 1986), 14. ² Harry T. Peters, Currier & Ives: Printmakers to the American People (New York: Doubleday, Doran & Company, Inc., 1929), 1:108. ³ George Catlin, Letters and Notes on the Manners, Customs, and Conditions of the North American Indians, 4th ed. (London: D. Bogue, 1841), 2:18. This entry was posted in Academic Programs, American Culture Studies, art collections, museum collection, Uncategorized and tagged american west, Currier & Ives, exhibition, frontier, Winterthur Library, Winterthur Museum Garden & Library. Bookmark the permalink.